Please Note: I’m moving country at the moment so the ‘polish’ on my articles for the next couple of weeks may be a bit lacking. The content will still be relevant, but just not packaged as well as usual. I recently wrote up an analysis of psychic defenses, breaking them into two types: one that tries to block the power after it has passed the psychic test, and a second that simply tries to make it harder to pass the psychic test to begin with. It grew some legs on DakkaDakka, and a few good readers pointed out that it’s hard to use my work for direct comparisons as the odds of initially passing the psychic test wasn’t factored in. This was actually intentional (and noted in the post itself) as the odds of passing created another variable to track (namely the leadership of the caster). But given the feedback I thought I should revisit the analysis to provide something more user friendly. 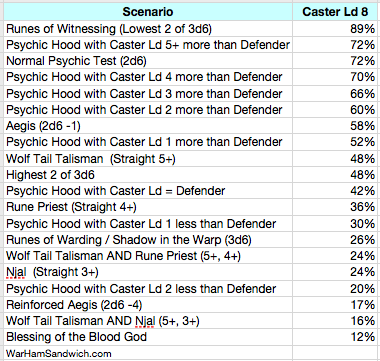 I’ve done an end to end calculation for caster leaderships 10, 9 and 8 showing the total odds of passing the psychic test and bypassing the defense as one percentage. By necessity it’s a separate table for each of the three leadership values, with each row representing some form of particular defense (or in the case of runes of witnessing, a bonus). So the left column is the particular situation, and the right is the odds of the power being successful. 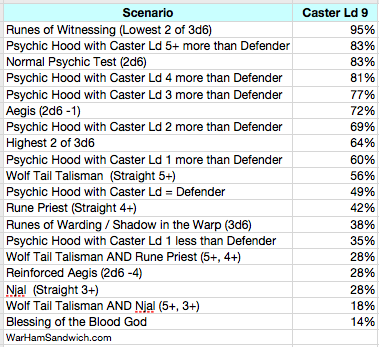 So with a caster Ld10, ye olde Psychic Hood is not brilliant since the defender can at best match the caster Ld. So it lags behind Runes of Warding, Rune Priests, and Reinforced Aegis. (I will note here that I have not factored in the differences in how and when the psychic defenses can be used, e.g. the range difference between Runes of Warding and Shadow in the Warp is huge but I’m focusing only on the dice mechanics here so I leave it to the reader to know and interpret the context accordingly). At caster Ld9 the Psychic Hood starts to get a look in. 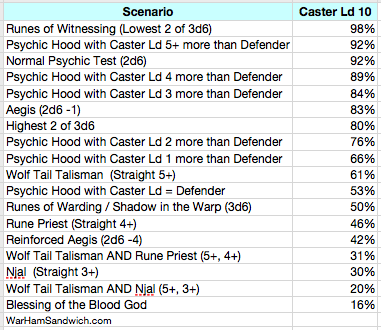 If the defender has Ld10 to the caster’s Ld9 then it gives a better defense than Rune Priest, Runes of Warding and Shadow in the Warp. Reinforced Aegis still beats it on the odds though. At caster Ld8 the Hood gets better again. With an Ld10 defender the odds of a successful psychic power is only 20%. Again this beats Rune Priest, Runes of Warding and Shadow in the Warp, but Reinforced Aegis still maintains better odds. If there are other particular special rules, quirks, strange situations, or anything else I’ve left out then please do leave a comment! This entry was posted on Wednesday, October 5th, 2011 at 4:38 pm	and posted in Probability. You can follow any responses to this entry through the RSS 2.0 feed. So how does a straight up 4+ to negate a power (runepriest staff) = not exactly 50% chance for the power to go off? You have it as a 46% chance of the power not going off. good question, and one that gets to the very heart of why I did the Part II article. The simple answer is that the 46% also includes the odds of the original psychic test failing. 50% assumes that the power is initially successful.